What is fine motor and why is it important? Fine motor skills are movements involving the smaller muscles groups such as those in the hands and wrists. Fine motor skills are used everyday. Developing your preschoolers fine motor skills will allow them to build independence. Some examples of everyday fine motor skills include: holding silverware, pouring a drink, coloring, cutting, cleaning with a rag or sponge, buttoning, snapping, and zipping. These are just to name a few. 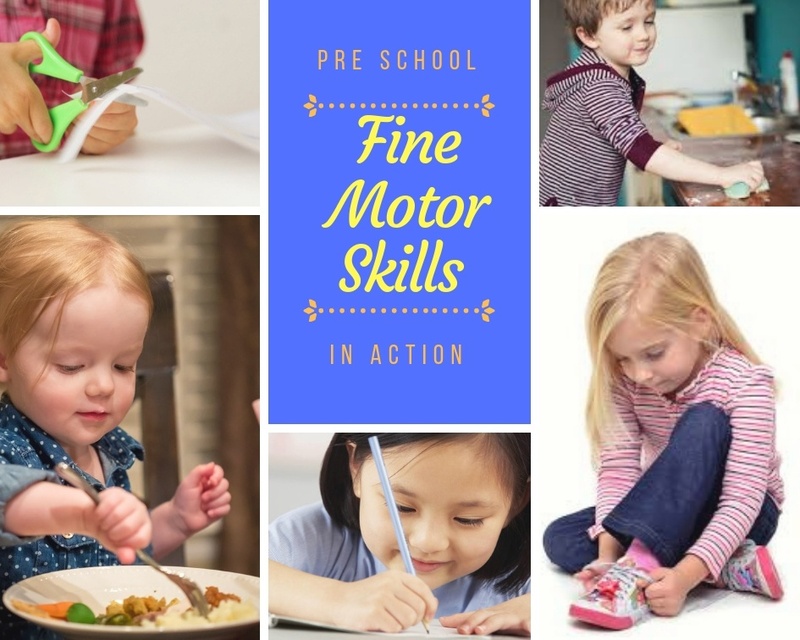 In addition to helping your child become independent, fine motor movements help strengthen the neural pathways that are later used in cognitive skills such as reading and math. In fact, it has been found that fine motor skills developed early are a strong predictor for future reading and math success. Last, when it comes time to put your fine motor skills to work, children who are more comfortable are able to focus on what they are writing, rather than devoting their focus to the motor portion. Most children love to play in the water, but did you know that you can promote fine motor skills in the water. Provide your child sponges, a water bomb, or wash cloth. Have them get the washcloth wet and then ring out the water. This can be done in the pool, the backyard, while washing the car, or in the bathtub. Watch your preschooler carefully and you will see all of the tiny muscles in their hands working hard at this activity. There are many different activities that you can do with clothespins. The first step is to teach your preschooler how to pinch the clothespin to make it open and close, once they have figured that out you can try many different games and activities. Purchase pom poms and have your preschooler pick up the pom poms with the clothespin and sort them by color. Or try writing a letter on each clothespin and have your child clip them in order to spell their name. You can also purchase colored clothespins and have them clip them to the matching color on a flashcard. The possibilities are endless. Most children love to stack blocks and love to knock them over so they can do it again. Stacking is a good way to work on fine motor development. Stacking incorporates the pincer grasp as well as hand eye coordination. There are many great varieties and toys to try when it comes to stacking. You can stack with foam blocks, wooden blocks, Duplos, and nesting cups. The number of blocks your child can stack will depend on their age, there are different developmental milestones when it comes to block stacking. With modeling, encouragement, and practice your child will be stacking away. Play-dough has long been a go to for fine motor activities for preschoolers. With slime becoming more and more popular why not incorporate slime as well. Try one of these activities. First, squish the dough or slime. Learning how much force is needed helps fine tune muscle strength and control. Second, using your index finger poke holes into the dough, thus working on finger isolation, the ability to use fingers one at a time for a specific task. Last, use the dough or slime to make a creation. The manipulating of the dough develops strength of the hands. Using real coins, plastic pirate treasure, or poker chips work on transferring coins from one hand to another or from one pile to another. Coins can also be pushed through the slot of a piggy bank. For a little resistance, and additional hand strength, create your own bank by cutting a slit in a plastic lid. For an added challenge, try each activity using the non-dominant hand. Velcro, zippers, and snaps are all very practical fine motor skills. These are skills that your child needs in order to put on their own shoes and clothes. Your child needs to practice the action of coordinating both hands to work together to pull objects apart and put them back together. Try adding velcro dots to the end of craft sticks. Your child can connect the sticks to make a line, letters, or shape. Jigsaw puzzles have many great benefits to the preschool child. Puzzles help to develop problem solving, hand eye coordination, and of course fine motor skills. Children must use different grips to pick up each piece and turn it until it is in the correct position. Then, once the piece is in the correct position the child works to push each piece together. Thus teaching about the ability to use the muscles in the hand to apply pressure. One of the greatest benefits of playing with Mr. Potato head is that it promotes bilateral hand coordination, the ability of both sides of the body to coordinate, at a basic skill level. Bilateral coordination is extremely important and will be used for skills later in life like tying your shoes and cutting food. In addition, Mr. Potato head also encourages kids to begin using their thumb, index, and middle finger to grip the different parts as they add them to their creation. This grip, known as the radial digital grasp will help with handwriting development down the road. Stringing beads is a great way to develop the hand eye coordination that goes along with most fine motor skills. Learning to string beads can be very challenging for young students. It is important to start large and work down. To begin, cut a pool noodle into pieces and trying stringing the pieces on a jump rope. Once your child becomes proficient try a more challenging activity such as adding beads to a pipe cleaner. The pipe cleaner helps minimize frustration as it is sturdy enough that the beads don't fall off. Encourage your child to participate in art time. Scribbling, coloring, painting, tearing paper, folding paper, cutting, and gluing are all ways to promote fine motor development while allowing your child to be fun and creative. Get out the supplies and challenge your child to make a creation in anyway that they choose. The options for fine motor skill development are endless. 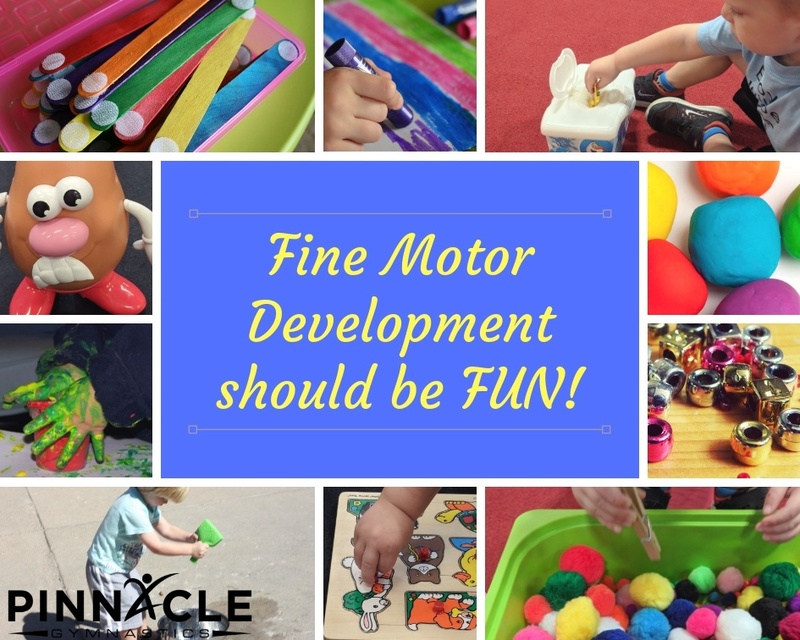 Be creative and encouraging as you help guide your child through the many milestones of fine motor development.